The Pacers have done nothing to advance their team since the awesome 61 win team of 2003-04. In that time, their win totals have tapered off slowly; 44, 41, 35, 36, 36, 32. They make moves more befitting of a championship contender (Dahntay Jones for 4 years? Earl Watson for one? Drafting Tyler Hansbrough? Trading for Mike Dunleavy and Troy Murphy?) when they haven’t the core around which to build. Apart from catching lightning in a bottle with the drafting of Danny Granger, the Pacers have done nothing to build a young foundation, nor have they done anything to build an old foundation. George represented the Pacers highest draft pick since 1996, when they picked Erick Dampier 10th overall. Indiana normally drafts low because they’re good – in the last few years, however, they’ve been drafting in the late lottery. They are not good enough to make the playoffs, yet their needless short term moves also ensure they are not bad enough to draft higher than that. Not since George McCloud in 1989 have the Pacers drafted in the top 10; not until next summer will they have any cap space. Without those things, the Pacers have been unable to land a star or any significant young talent, and while the #10 pick in a strong draft represented a chance to do, all Indiana have done is use it on a player who plays the same position as their best current player. This is a re-think on my draft night stance, admittedly. Nevertheless, we’re going to have to sign away one more season of moribund stalemate for the Pacers. When 2011 free agency comes around, maybe they can finally build something significant. I have long since clamoured for Hendrix’s NBA talent, going as far as to cite him in my list of people the Bulls might want to sign to the minimum to pad out their roster. Hendrix can still rebound the bejeezus out of the ball, and I can’t think of a single NBA team that couldn’t use that skill. However, Hendrix has already signed for next season with Maccabi Tel-Aviv. His presence here might therefore be kind of academic. 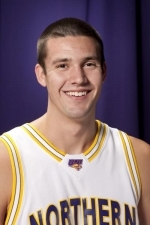 Vanilla jokes aside, Koch was a key cog in Northern Iowa’s season which crescendoed into a huge upset win over the number 1 seeded Kansas Jayhawks in the second round of the NCAA tournament. Koch was a star role player on the team, winning the Missouri Valley Conference player of the year award, but he doesn’t have NBA prospects, a large but fairly slow 6’8 with a mid range jumpshot but without much three point range. Then again, Brian Scalabrine’s NBA career just ended, so there’s a vacancy for a guy like that. Kramer is an extremely strong 6’3 defensive specialist with no discernible offensive talent whatsoever, who really should have played football instead. He was a great fit for a big program in the college game, but he’ll be far less great in the professional arena, where the players get harder to defend. It would be a great thing for the fan’s perspective to see him do well, for the Purdue graduate is a local boy, but unfortunately, Kramer is let down by his own face. He’s just too good looking for me to root for anything other than his abject failure. Surprisingly, Carl’s younger brother made it almost the entire season. In workouts and summer league last year, Marcus demonstrated more a far better three point shot than he was ever allowed to show as Wisconsin, and made the Knicks roster on that basis. He was later a throw-in in the Nate Robinson trade that sent him to Boston; bizarrely, with two weeks to go in the season and Landry’s contract fully guaranteed, the Celtics then waived him so that they could give roster spots to Tony Gaffney and Oliver Lafayette. I guess Landry didn’t win them over as much. Landry’s staple has become his shooting, but he is not able to create those shots for himself. He averaged only 11.4 points and 4.3 rebounds while on assignment in the D-League, and may have just been a flash in the pan. If he can improve his ballhandling or make a name for himself defensively, it would greatly help his chances of a comeback tour. Mays spent last season trying to turn himself into a three point shooter . Then in Puerto Rico playing for Humacao, Mays put up his usual good numbers across the board, but his scoring efficiency was poor all season. This is mainly because he took five of those three pointers a game, attempting one in at least every game he played. And since he played 25 out of the team’s 29 games and stayed the whole season, this amounted to 115 three pointers in total in only two months. That’s a lot for a man who shot only 51 in total in 4 years at Clemson. And the 29.6% conversion rate doesn’t seem to justify it. Before that, Mays was playing in China, where he averaged 26.0ppg and 13.2rpg for Shougang while shooting 44% from three on four attempts per game. Mays has always preferred to face the basket, and is a talented face-up passer, yet perhaps the reason for his new-found three point affinity has something to do with the torn achilles tendon that caused him to miss almost all of the 2008-09 season. That can cripple a man’s athleticism. Despite three years of NBA experience, and having almost all of his contract for next season guaranteed (it became $500,000 on June 20th), McBob is still doing summer leagues. He played his first ever significant minutes last year and responded with a 14.8 PER, averaging 4.3 points, 3.0 rebounds and 1.0 assists in 12.5 minutes per game. McRoberts is capable of a lot more than the minimum salary deep-bench role he has been stuck with in his first three NBA seasons, and finally hinted at that last year. Still aged only 23, he is deserving of a bigger role. This means no unnecessary depth, Indiana. Apart from the people on it, Robinson has the best chances of anyone on this list of making the Pacers roster. They sorely need a point guard, and Robinson has become a very good one. He cracked the NBA last year when he signed with the Cleveland Cavaliers for training camp, but did not make the team and returned to the D-League, at first with the Reno Bighorns and then with the Maine Red Claws. R-Rob averaged 16.4 points with Reno and 16.3 with Maine, and he shot 38% from three with Reno and 37% from three with Maine. He shot four and a half three pointers per game on the season; the days of Russell Robinson the passer are fading away. In fact, he may have gone too far the other way now, for he averaged only 3.7 apg with the Bighorns (with a 1:1 assist/turnover ratio). But the defense is still there, and now he has the complimentary three point shot to go with that. He is a solid all-around player who might have the perfect opportunity. By the time Solomon Jones’s rather unnecessary two year contract expires, Magnum Rolle will be 25 years old. Despite how much we might want to believe otherwise, not many players improve after that age, and those that do don’t do so by much. Rolle wants to win rookie of the year – mercifully aware that making the roster is a more pressing concern – but the question of whether he is talented enough to make the team is a much more pressing concern. His athleticism and shot blocking instincts are in place, but that’s about it. At age 24, that’s a worry. The question, now, is whether he already has enough defense to make it. He might. The Pacers are said to be considering Stephenson as a man who could possibly use up some of the readily available point guard minutes. For a man with questionable shot selection, average athleticism and a stubborn refusal to move the ball, that doesn’t seem like a good idea. A favourite of Rick Kamla, Taylor spent last year in Germany, where he averaged 12.5 points per game for Telekom Baskets Bonn. Normally known as a shooter, Taylor didn’t shoot the ball very well last year, hitting only 31% from three point range. But he did get to the line five times a game, shooting one free throw to every two field goal attempts, pretty damn impressive for a 6’5 guard. Syracuse big man Watkins did not play last season. He started it in camp with the Cavaliers, and was one of their last cuts before moving to the D-League and being assigned to the Iowa Energy; however, he started to suffer from plantar fasciitis before the season began and never played a game for the team. He never played for any team, in fact, and has missed the entire season. When healthy, Watkins is a good shot blocker and capable finisher, who tends to struggle with turnovers. And fouls. And plantar fasciitis. Williams turned down a 10 day contract from the Pacers at the end of last season, and now that he has wound up with them anyway, that decision looks even stranger. Williams is good enough to be in the NBA, which is why he has been on more than once occasion; however, with the Pacers current proximity to the luxury tax, they need point guards more than anything. Williams has been putting in work to turn into one over the last few years, but he isn’t one. He’s more of one than Lance Stephenson is, admittedly, yet he’s not one. As such, there doesn’t seem to be room for Williams on the Pacers any more, particularly after the addition of Paul George. He had his opporutnity and didn’t take it. He’ll be very lucky to get another. AJ Price blew out his knee this summer while playing in a tournament in NYC. He's not likely to make it back for training camp, and if he wasn't signed for 2 more years dirt cheap, he'd likely have been waived to clear a roster spot for the eventual PG signing. Good point Batman. Completely forgot that. Price had a good rookie season, I'd like to think they'd wait it our for him. Oh, uh, why weren't those previous comments visible before?